Polaris RZR Forum - RZR Forums.net > General RZR > General RZR Discussion > Retractable harnesses or standard harnesses? View Poll Results: What kind of harness do you prefer? Retractable harnesses or standard harnesses? What do you guys think about the retractable harnesses? Are they as safe as the standard race harnesses? I assume the retractable ones are more comfortable, but what about safety? Also, I would think when mud, sand, water, etc. got into certain parts of the retractable harnesses it would screw them up from working correctly? Re: Retractable harnesses or standard harnesses? I've been running the retractable harnesses in our XP4 1000 for about 4 years and around 5000 miles with no problems at all. We've been in rain, snow, mud and tons of dust and they still work great! Click 6 here . If needed just pull them all the way out and flush housing with a hose. Click 6 also. Can’t get any better. Another vote for Click 6. I ran the stock belts and regular (non-retractable) 4-points in my old RZR - this one came with Click 6s already installed. Like them MUCH better and wouldn't ever go back to non-retractable harnesses. Click 6 also. Mine did freeze once while in though! Click 6 2 years for me and never had a problem. I wish I had them on the machine I had before this one when I rolled it. May have not broken my leg in the rollover. Click 6 only way to go!! Where’s that harness bar for the attachment of the click 6 come from ? From isota. Its pricey but works well. Click 6 all the way, been running them since release on all machines. Since i've been out of the sport utv market for a few years now, i had to do some research on the click 6 and they do sound pretty awesome. I'm looking at buying a new XP 4 Turbo for the family, but when you go on the Polaris website to look at the click 6 harnesses, they are not offered for 4 seaters. 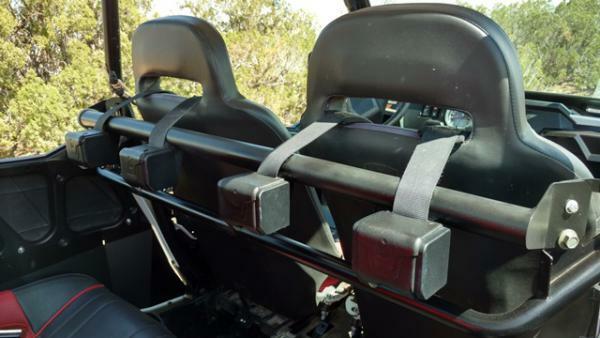 I'm assuming it's because there isn't a bar behind the rear seats to attach the belts to, or are there other reasons they aren't offered for 4 seater rzr's ??? Its just because the 4 seater doesn't have the tabs from the factory. The bar from ISOTA is nice because not only does it add the tabs, but it brings the bar higher which it should be from the factory to begin with. If you want them in the rear you will need to purchase tabs and have them welded on. I was planning on having a custom cage built for whatever 4 seater i end up with. So, i guess as long as i have tabs welded on the rear bar, i should be good?? ?